Great roses begin with good soil! Does your soil have adequate nutrient levels and the proper pH? 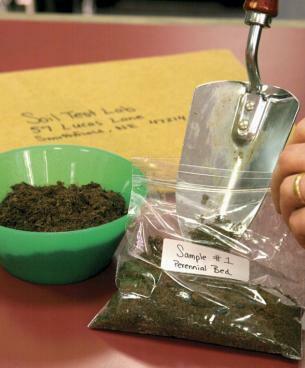 Find out by taking a soil sample. You can test the soil in a new bed before planting, or from an existing rose bed. You need 2 cups of soil from the planting area(s) to be tested. Remove the mulch and use a trowel to scoop out soil starting at the surface and digging about 6 inches down. Dig several holes from various places in the bed, put all this soil together in a clean bucket, stir it up, then collect two cups of this mixture to be your sample. Put the soil in a zip-top baggie or clean plastic container and take it to your local Extension office. You will be asked fill out a form with information on your garden and the type of plants you are growing. It may be free, or there may be a small fee depending on the number of nutrients you would like to test. In a couple of weeks, you'll receive the results of the soil analysis and recommendations for improving your soil.